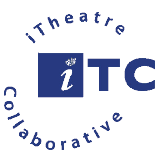 iTheatre Collaborative is one of the Valley’s youngest and most exciting theater companies. Though, like most small troupes, it must make do with limited resources, the company’s work is good and, at time, superlative. It is criminal that more people don’t go to see it. Christopher Haines, artistic director of iTheatre Collaborative. A member of Actor’s Equity Association, Christopher Haines is a theater veteran with over twenty years of experience as an actor, stage manager, writer, director and designer. He graduated in 1991 from Duke University. 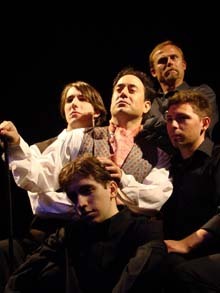 Some of Christopher’s stage work includes: as an actor, the title roles in The Collected Works of Billy the Kid and Danton’s Death, Ralph in Frozen, Orson Welles in Orson’s Shadow, the Librarian in Underneath the Lintel, the Third Man/Doctor in Baltimore Waltz, Prospero in The Tempest, Vladimir in Waiting for Godot, Alan Seymour in Picnic, Vernon Gersch in They’re Playing Our Song and Mr. Rich in Celebration. He has directed such productions as Deathwatch; Dogg’s Hamlet/Cahoots Macbeth; The Congresswomen; Cat’s Paw; Molly Sweeney; The Fish Must Die and Carolina on Our Minds. As a designer his work includes: Topdog/Underdog; A Raisin in the Sun; Gunplay; Peter Pan and Wendy; Wizard of Oz; The Colored Museum; The House of Bernarda Alba and Horn in the West, a 1,500-seat outdoor amphitheater in Boone, N.C. In 1994, Christopher collaborated with the internationally acclaimed director, Lee Breuer, on his project, Wrath of Kali, as the Director of Videography, both in its debut in Phoenix and in New York. Other design work in video and photography includes; the Daniel Lentz Group’s A Crack in the Bell, such plays as Jack; Reel to Real; Romeo and Juliet; Sweet Thunder and Don’t Bother Me, I Can’t Cope. He also has served as the Director of Photography on the feature films, Wake of the Hero and Means of Escape. 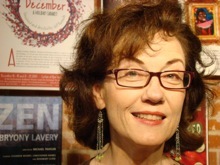 Rosemary Close, Managing Director of iTheatre Collaborative. Rosemary Close has been involved in theater in the Valley for over twenty years. Her work dates back as far as the Arizona Contemporary Theater Company, Northwest Studios and the Glendale Little Theater to name a few oldies. Her onstage credits include; Frozen; Harvey; Chapter Two; Barefoot in the Park; Cabaret, The Balcony; The Way We Live Now; Royal Gambit; Loves Scenes from Romeo and Juliet; Reel to Real; The Collected Works of Billy the Kid; The Maids and Skimpies. In 1991, Rosemary began her longtime association with the New York theater company, Mabou Mines. She appeared in numerous productions with that company both in Phoenix and New York. The highlight of her work with Mabou Mines was a leading role in the multimedia stage production, Wrath of Kali, directed by the award winning and acclaimed Lee Breuer. In our first season we presented the regional premiere of a play called Bee-Luther-Hatchee by Thomas Gibbons. 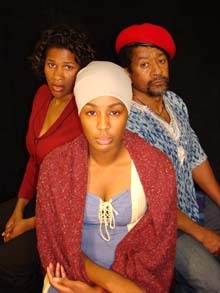 It was a play that confronted the audience with issues of race, identity and cultural ownership. To this day, patrons still want to talk about that show. They still remember it, and are still thinking about its messages. That is what iTC is about. The work of iTheatre has garnered rave reviews, critical and popular acclaim, as well as national attention. We have produced numerous regional and world premieres. 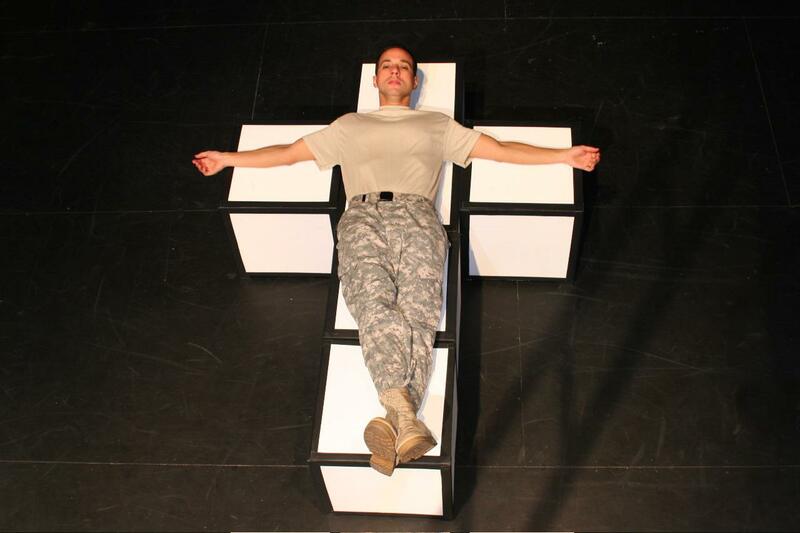 iTC is committed to utilizing and employing the artistic talent of local, Phoenix-area actors, directors and designers. Nationally, iTheatre has been sought out to perform its work at such national festivals and conferences as; the National Black Theatre Festival in Winston-Salem, NC, the Black Arts Movement Festival in Austin, TX, and the Last Frontier Theater Conference in Valdez, Alaska. Recently, a theater critic described iTheatre like this, ‘You can’t call iTheatre Collaborative an alternative company, but rather an eclectic collective.’ Time and again, we have produced work that is both challenging and thought provoking to our audiences. itheatre collaborative. 2012. Nine Circles. Playwright-Bill Cain. Director-Steven J. Scally. Cast-Phillip Herrington. Photo by Chris Haines. “The Play About the Baby” Cast: Jacqueline Gaston. Jacqueline played The Woman in Edward Albee’s play that had its workshop premiere in 1988 and its world premiere at Houston’s Alley Theatre in 2000 (the company took it to off-Broadway the following year). The work, whose other characters are known as The Man, The Boy and The Girl, is a dark and witty account of two couples–the combination of jaded Man and Woman vs. innocent Boy and Girl that provided a similar dramatic tension in 1962’s Who’s Afraid of Virginia Woolf? “At Home in the Zoo” Edward Albee’s Zoo Story is paired with his Homelife. Director: Michael Traylor. Cast: Christopher Haines, Greg Lutz, Shannon Whirry. “Underneath the Lintel” Comments: “Would you recognize a miracle if you saw one?” The game’s afoot when a mild-mannered Librarian finds a book that is 113 years overdue (returned in the overnight slot, no less!). His attempts to track the offending scofflaw and give him the fine of his life take him around the world and to conclude he is chasing a myth as old as Christ. SEPTEMBER Jeff Kennedy: Still Myself. A concert with musical artist Jeff Kennedy and his friends. SEPTEMBER – OCTOBER The Exonerated. Playwrights: Jessica Blank, Erik Jensen. Director: Charles St. Claire. Cast: Rod Ambrose, Ron Foltz, T.A. Burrows, Mike Traylor, Terri Scullin, Robert Peters, Walt Pedano, Todd Isaac, Toni Robinson, Colleen Hartnett. Sound Designer: Damon White. Lighting Designer: Charles St. Claire. Production Stage Manager: Kevin Watson. Moving between first-person monologues and scenes set in courtrooms and prisons, The Exonerated is the true stories of six wrongfully convicted survivors of death row in their own words. The interwoven stories paint a picture of an American criminal justice system gone horribly wrong—and of six brave souls who persevered to survive it. DECEMBER Christmas: The Magic Continues. This annual musical cabaret featured songs, both old and new, sung by some of the Valley’s best voices brought together by Jeff Kennedy and his grand piano in the company’s signature cabaret style setting with drinks and treats at the bar. MARCH The Submission. Playwright: Jeffrey Talbott. Director: Charles St. Claire. 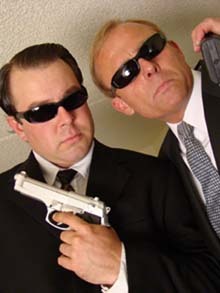 Cast: Kyle Lambros, Richard Bates. Randy Rice, Nicole Belit. Scene Design: Christopher Haines, Charles St. Claire. Danny has written a new play about an African-American family trying to get out of the Projects, and it has just been selected for a preeminent play festival. Problem is: Danny, a young, gay, white playwright, submitted the work under a pen name in the hope of increasing its chances for production. So he hires Emilie, a black actress, to stand in for him as author. What starts as a terrible idea becomes more terrible as Danny drags Emilie, his boyfriend, and his best friend down a long and dirty path of lies, hypocrisy and betrayal. A fiercely funny and intelligent new comic drama about the words we use to describe each other and the things we’ll do to get what we want. 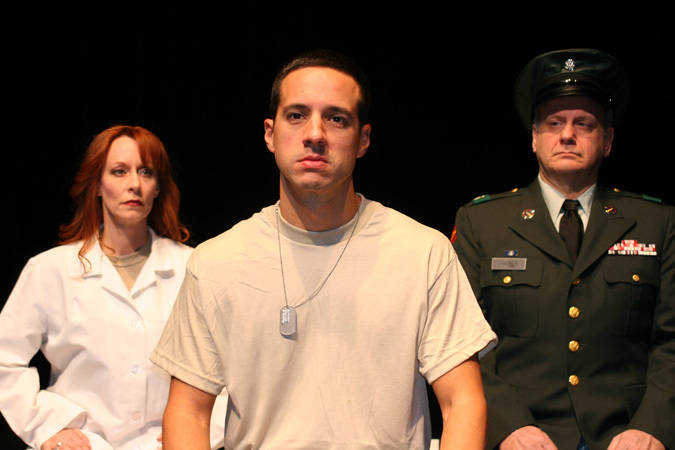 “The Submission” was a semi-finalist for the 2010 O’Neill Playwrights Conference and won the inaugural Laurents-Hatcher award in 2011. It also won the 2012 Outer Critics Circle John Gassner Award for Best New Work. Due to a casting issue, we are postponing our upcoming production of “By the Way, Meet Vera Stark” by Lynn Nottage scheduled to run March 7-22 on the Kax Stage. There was one role we were just not able to cast, but, hopefully, over the summer we can get it done. We plan to open next season with Vera Stark because we think you really should meet her. But never fear, we are replacing it with a new award-winning play called The Submission by Jeff Talbott. It is a searing, no-holds barred comedy/drama that you should find quite controversial and, dare I say it, thought-provoking. In short, the kind of play you have come to expect from iTheatre Collaborative. 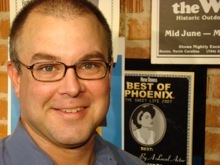 Jeff Talbott has written five full-length plays and two one-acts. He graduated with honors from the Yale School of Drama. His play “The Submission” was the inaugural recipient of the Laurents/Hatcher Award in 2011 and was produced off-Broadway by MCC Theater, directed by Walter Bobbie. 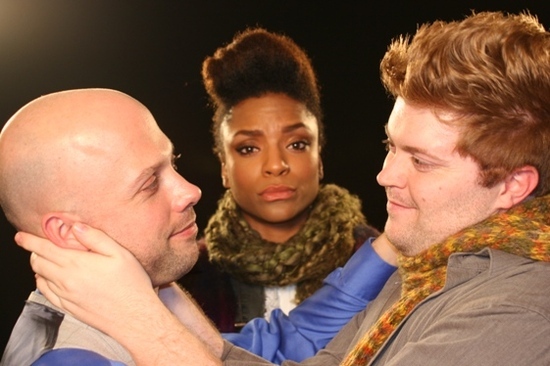 It also received the Outer Critics Circle John Gassner Award for New American Play in 2012. The play is published by Samuel French, was a semi-finalist for the 2010 O’Neill Playwrights Conference, and was in the final round of consideration for the 2010 New Play Summit at the Denver Center. He is also the co-author of Critical Moment (with Stephen Kunken), which was a semi-finalist for the New Play Festival at Denver Center Theatre, and a section of which was a finalist for the Heideman Award for best 10-minute play at the Humana Festival at Actors Theatre of Louisville. His one-acts For Nate and Molly and Tender were both given world premiere productions by the Yale Cabaret.